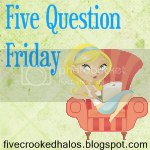 I really love the idea of Five Question Friday but I usually forget to do it. NOT this week! 1. If you could speak with a different accent, what would it be (i.e Australian, Scottish)? Well, I melt when I hear a guy with an Irish accent (think Colin Farrell) but I'm not sure I want to speak in one. I think I'll go with an English accent...I worked for a company that was owned by a British firm and whenever I was around my British bosses, I wanted to adopt their accent! I can NOT sleep on an airplane but I can instantly fall asleep on a bus and in a car! My favorite place to fall asleep is my couch...Big Red. 3. Do you use public restrooms? If so, do you sit on the toilet? I do NOT use port-a-pots unless there is NO other option and I can't hold it any longer! I do use public restrooms and I do sit if they look "clean." While traveling, I do tend to stop at fast food joints instead of gas stations to use the facilities. Just recently I've re-discovered that rest stop bathrooms are normally clean and not so smelly. 4. If you were stuck in an elevator for 24 hours, what celebrity would you most want to be stuck with? 5. Where did you & your significant other go on your 1st date? Also, some of my friends have started a cool new series...the Real Farmwives of America - check 'em out! HEY! You hit your 200th follower! WOO HOO for you! Lately I cannot even sleep in my bed! They say it's my age and all that goes with it, but I would kill for a restful, dreamless night (of course I DO want to wake up in the morning!) Nor quite ready for the big sleep yet! Too much to do! 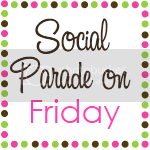 I am your newest follower from the blog hop. I hope you can me back at http://mylifeadventurebyme.blogspot.com/. Saw a suggestion once to stop at hotels with lobbies to use the restroom while traveling because they are almost always very clean! New follower from blog hop. Hope you'll follow back. I have a big red and it also is my favorite placed to fall asleep. lol at your date question. I have a blog award for you over at my blog so hop on over and check it out.